This Kentucky basketball team brings to mind last season’s Kentucky basketball team. Plenty of obvious similarities exist. These aren’t carbon copies of each other, to be sure. Last season’s team seemed to be losing the plot on a number of occasions, such that Kentucky was on the verge of being a No. 8 or 9 seed in the NCAA Tournament. The Wildcats had to make a very familiar run at the SEC Tournament to boost their March seed. That team was overwhelmed at times. It took a long time to find its way, and at the end of its NCAA Tournament run, the effort and commitment to basketball were there. 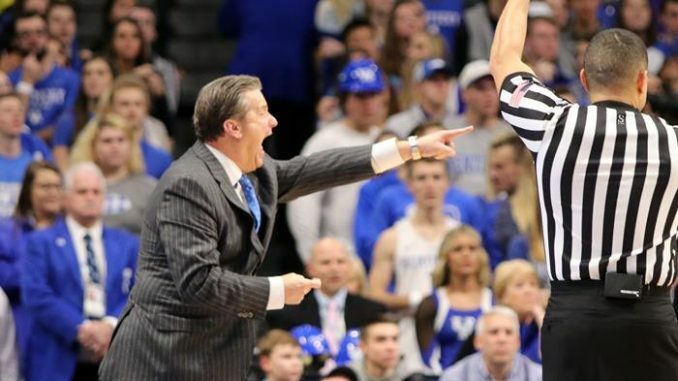 John Calipari got his team to play with clarity, if not elegance. What hijacked a possible dash to the Final Four — an even more improbable run than 2014 — was nothing more than foul shots against Kansas State in Atlanta. Defense, rebounding, attention to detail — Big Blue brought those essential components to the dance, but the charity stripe was a place most “foul” for UK, and that’s why Kansas State slipped away. This season’s Kentucky team hasn’t seemed lost so much as unreliable. This team has more quickly arrived at a formula which clearly works. You could see in the North Carolina game the blueprint which will carry this team: Crush the boards. Use size and length to win more loose balls and possessions while also bothering opponents on defense. Hit a few timely 3-point baskets to stitch together the whole effort. Last year’s team — at least for much of the regular season — seemed to need Kevin Knox to go off in order for everything else to work and give this team a chance to be great. This team isn’t nearly as dependent on one player. With Quade Green leaving the program, roles are actually better delineated and the roster appears to be more cohesive. There isn’t a Hamidou Diallo dragging down the offense and holding everything back. This is a team in which the guards might have less raw upside than last season, but know their roles better and have a better understanding of how to play. For the 2019 Wildcats, more of the focus belongs on the frontcourt — not that it was fluid and consistent last year, but with more development and with the addition of Reid Travis from Stanford, this unit should be better… but isn’t. John Calipari has said that P.J. Washington can be a great player. Last year, it was reasonable and fair to say that he and Nick Richards were in their evolutionary stages, but this season — with another year in the system at a program known for cranking out NBA-level players with great regularity — they should be much more advanced than they are. We have seen Washington provide what he is capable of producing at times, but while we have gained glimpses of his ceiling, his floor is still far too low. Something similar can be said of Travis and Richards, who joined Washington in doing very little against Vanderbilt this past Saturday in Rupp Arena. It is true that Travis and Washington were solid on the boards, but 10 points from three players in 72 combined minutes of playing time is so much less than what this frontcourt should deliver. 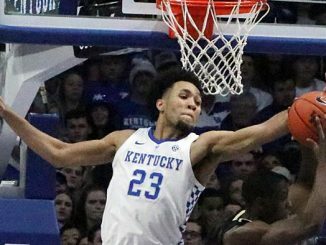 Moreover, when you consider that Vanderbilt might be the worst team in the SEC right now, it becomes that much clearer that as the Cats move into mid-January, they have to expect — and Calipari has to demand — that the frontcourt simply CANNOT disappear at one end of the floor for the rest of the season. You can be outplayed by a better team — Vanderbilt isn’t that. You can defer to the guards in most instances — Kentucky’s backcourt had to carry the workload against Vanderbilt, and mostly on two-point shots, not threes. Yet, it should not be viewed as unfair to insist on better and more balanced frontcourt production from the players Kentucky has in its regular rotation. Whereas last year’s team looked out of place for several weeks of the SEC season, this team has its template — it has the formula which works. The frontcourt needs to apply it more, especially in light of its experience. This is not a freshman-dominated frontcourt learning on the job. This should be a more polished group, but the early portion of the SEC season has not displayed that kind of a group. What does this mean for Kentucky in the SEC, however? This is where the landscape has changed relative to last season. It’s not that UK is dramatically different; it’s more a case of the SEC shifting around UK. Last year, the gap between Kentucky and the top team in the SEC was smaller than it is now. Auburn was the best team but was merely a 4 seed in the NCAA Tournament and did not have its own preferred frontcourt with Austin Wiley unavailable. (In many ways, Auburn and Kentucky this season are similar in that their frontcourts aren’t as reliable as they should be.) Tennessee was good, but as you can tell, the Volunteers were still a year away from putting all the pieces together. This Tennessee team is playing like a No. 1 seed. It is a few notches better than 2018 Auburn. Viewed through that lens, Kentucky faces a much tougher challenge in the 2019 SEC compared to last season. However, with this year’s Auburn team regressing alongside Florida and Arkansas, Kentucky has a much, much better chance of being the second-best team in the SEC by season’s end. Winning the league will be especially hard, but climbing over every non-Tennessee team in the league seems very attainable. UK is in especially good position to bludgeon Auburn into submission. Kentucky’s defense should be able to corral the Tigers in ways it could not do last year. UK’s prospects are brighter this season not only because the guards show a better sense of responsibility at both ends of the floor, but because the upper tier of the SEC — save for the mighty Vols — has taken a few steps back relative to last year. That said, if Kentucky’s frontcourt doesn’t begin to expect more of itself and develop the way a Calipari-coached unit should emerge over the course of this season, the 2019 Cats will be held back. This is the big cautionary note for Kentucky, too: Even though UK is headed for a higher NCAA Tournament seed than last year’s No. 5 slot, the counterbalancing reality for the Cats is that they can’t expect a bracket to collapse in front of their eyes the way the South Region did in 2018. Kentucky can’t count on playing a No. 13 seed in the second round and a No. 9 seed in the Sweet 16. If Kentucky gets a No. 3 seed this year, the laws of averages suggest it will have to play a No. 2 seed in the Sweet 16. The short-term picture isn’t nearly as alarming for Kentucky as it was this time last year. That’s the good news. The bad news is that the March path probably won’t be as favorable. The script is familiar, but the world outside the SEC is different. This makes it imperative for Big Blue to make big frontcourt adjustments this week.